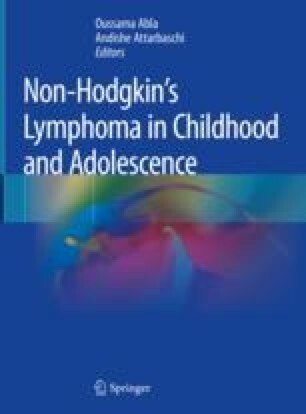 Primary central nervous system lymphoma (PCNSL) is a rare brain tumor in childhood. The exact incidence and pathogenesis in children are unknown. Due to the rarity and absence of prospective clinical trials, therapeutic decisions are usually derived from pediatric case series and adult trials. Most patients have favorable outcomes after treatment with regimens that include high-dose methotrexate and high-dose cytarabine. The role of rituximab and intrathecal chemotherapy is not well established, while whole-brain radiotherapy is routinely reserved for refractory or relapsed disease. A better understanding of the molecular biology of pediatric PCNSL and an ongoing international case registry might provide better insights and outcomes for this rare pediatric lymphoma subtype.